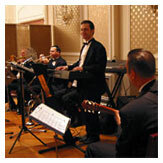 Jewishmusician.com provides exciting, upscale, live musical entertainment for wedding receptions, Bar/Bat Mitzvahs, and other private functions, serving the New York tri-state area and beyond. At jewishmusician.com, we know how much preparation is involved in planning the perfect simcha. Choosing the right band is one of the most important decisions you will make to ensure the success of your event. At jewishmusician.com, we pride ourselves on our meticulous attention to detail and personalized service, ensuring that your simcha is every bit as wonderful as you planned. The Binyomin Ginzberg Trio is a professional and experienced band playing elegant, creative and lively music at moderate volume. 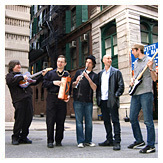 The group specializes in a sophisticated blend of spirited and soulful music that is perfect for dancing and listening. The jewishmusician.com Simcha Ensemble is a high-energy, full-size Simcha band with a polished and professional approach, tailored to meet your musical requirements. The Simcha Ensemble delivers a classy and crowd-pleasing experience you and your guests will love and remember long after the event is over! © 2003-2011 jewishmusician.com. All Rights Reserved. Site design by Thumper Media.